NATURAL disasters often occur without prior notice. In most cases, when they occur, they have devastating effects on human lives and property. While not much can be done to prevent nature from taking its course, early warning mechanisms should be taken seriously to mitigate the effects of natural disasters. Few weeks ago, there were outbreaks of multiple earth tremors in some parts of the Federal Capital Territory of Abuja that caused many residents to be in dire state of panic, agony and discomfort. For three days, the tremors caused great fears in communities of Mpape, Katampe District and parts of Maitama. Uncertainty faced the residents because earth tremors were unheard of in the FCT. Not only that, buildings and roads also suffered damage, forcing residents in the affected areas to relocate. The intense trembling of the ground made many to feel that the vibration took place was a sign of earthquake. Earthquake ordinarily inflicts substantial human, material and economic losses, which many affected countries rarely recover from when it occurs. The Nigerian Geological Survey Agency and other emergency agencies had always downplayed the likelihood of earthquake in the country. However, findings of the presidential committee, chaired by the Director-General, National Space Research and Development Agency, NARSDA, Prof. Seidu Mohammed, revealed the dangers inherent in human activities. The committee has revealed that the country is now prone to seismic hazards and that the possibility of an earthquake cannot be ruled out. Before the report of the committee, there had been a wrong perception that the nation was not at risk of earthquake meaning that without putting in place necessary measures, the safety of lives and resources would be jeopardised. Going down memory lane, Nigeria is said to have been rocked by earth shakes between 1933 and 1999. The 1999 tremor reverberated across many communities in the south-west states of Oyo, Ogun and Osun. The Abuja experience, which is 19 years after, is a wake-up call that there is need for a proper monitoring of all earthquake-prone areas in the country, just as some were recorded two years ago in Kwoi, Kaduna State; Saki, Oyo State; and Igbogene in Bayelsa and in 1984, around Ijebu-Ode, Ogun State; as well as Ibadan, Oyo State. Earthquakes tend to be concentrated in zones that coincide with boundaries of tectonic plates into which the earth is divided, even though Nigeria is said not to be situated at such plate boundaries. Updated appraisals in the geological, hydrological and geotechnical reports for Abuja have identified the underneath rock layers of the affected area as very weak and bearing several fractures and faults system. For many years, the upland area is said to be exposed to unregulated drilling and blasting of rocks by quarrying companies, artisanal miners as well as indiscriminate drilling of boreholes. NARSDA has raised an alarm that Abuja presently has a major vacuum underground due to excessive drilling of over 110,000 boreholes. To be adequately prepared for eventualities, the Nigerian Geological Survey Agency, NGSA, should enforce the laws criminalising indiscriminate mining, rock blasting and digging of boreholes while sister authorities should deploy necessary technology that would effectively monitor geological surveying methods across the country. Emergency agencies should put in place consistent awareness programmes and safety training in the communities prone to tremors and earthquakes on how to respond in the event of any emergency. The six earthquake-monitoring seismograms procured to enable proper monitoring of all ground disturbances for all the geological zones of the country should be put to maximum use. In a similar vein, Nigeria is no doubt under the fury of flooding in many states across the federation, just the same way that some states in the United States of America are negatively affected by Hurricane Florence. Both phenomena are water-inspired but response to them depends a lot on the attitude of the people when it comes to adhering to regulations and precautionary measures. In the US, citizens listen to and take predictions by meteorological services seriously unlike in Nigeria, where people who are bound to be affected by the calamity often decide to live in denial when told that the floods are coming. For instance, the timely response of the National Emergency Management Agency, NEMA, has helped in no little way to mitigate the impact of disasters. By conducting on-the-spot assessments of the impacts of the floods, NEMA often provided relief materials, rescued trapped people, defined areas of intervention and rescued vulnerable persons. The attitude and behaviour of the people who live in and disaster-prone areas should change. These precautionary warnings are always overlooked by the same people who would be affected when the time comes, due to ignorance, superstition and poor disposition to safety information. On a lighter mood, we recall that natives of FCT, under the aegis of Coalition of Abuja Indigenous Association, CAIA, have alluded that their ancestors were responsible for the recent earth tremors in Abuja, saying the claim by some government agencies and officials was not correct because the earth tremor was a natural incident to them. The natives had threatened to invoke the spirits of their ancestors to join them in the genuine struggle to liberate their people from the perceived marginalisation by the government! Therefore, consistent awareness and enlightenment should be embarked upon by the government on what should be done at periods of emergencies. Adequate funding should be provided for agencies that are saddled with the responsibilities of mitigating the impact of these calamities and providing succour to the people. This would enable them to have up-to-date technological equipment needed to address the challenge and the resources to provide welfare when judiciously utilised. Regulatory agencies should screen more closely, activities of miners and construction companies that are engaged in various works in Abuja and other parts of the country, especially those that are prone to earth tremors. They should be closely monitored. Mr. Kupoluyi, wrote from the Federal University of Agric., Abeokuta, Ogun State. Indiscriminate drilling of boreholes should be curtailed. Failure to provide municipal water services to the people is what is encouraging individuals to look for alternative water sources. Government should live up to expectations by providing basic infrastructural needs for the citizenry. This can be done better through the public-private partnership basis. 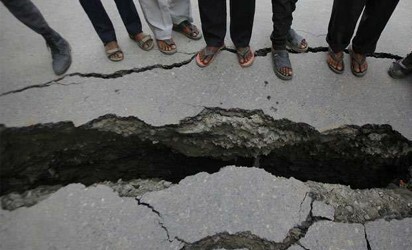 Despite the mixed feelings it has generated, the recent tremors should certainly serve as a wake-up call that earthquakes can happen in Nigeria. This is the truth. We just have to be pro-active.